Jungle Hijinxs is the first level of Donkey Kong Country. It is located within the first world of Donkey Kong Island, Kongo Jungle. The level starts off outside Donkey Kong's tree house. If the player turns back when beginning the level, they can enter the house for a Extra Life Balloon, or enter the banana cave beneath Donkey Kong's house to check on his Banana Hoard - where he can find his bananas gone (unless the player has finished the game, in which case his bananas are piled up in the cave). The level plays host to simple enemies: Gnawties, Kritters, Klumps, and a single Necky. It is also where the Animal Friend Rambi the Rhino can be used for the first time. It is a simple level with very few pitfalls. The Kongs can also run along the treetops to search for hidden items. As the Kongs come to the end of this level, it gets dark and becomes night time. The level starts when Donkey Kong shoots out of his tree house and then lands onto the ground. If he enters his Banana Hoard, he finds it empty, while if he enters his tree house found higher up, he can nab an Extra Life Balloon to gain an extra life along the way. Several trees also stand across from the house's entrance that the heroes can hop along to reach several more Extra Life Balloons. He must continue a few steps to encounter a Gnawty and Diddy Kong stuck in a DK Barrel on whom he must free. After this, the Kongs must continue along to a raised piece of land with a Kritter on it and a Gnawty underneath it so they can obtain the letter K of the K-O-N-G Letters. Afterwards, the Kongs encounter two Kritters on two raised pieces of land and two Klumps, whom they must defeat to continue along so they can reach the Star Barrel and the letter O next to it. Next, the Kongs come past another DK Barrel and the letter O to encounter a Necky, who shoots nuts at them as a weapon and along the way. The foe stands on a raised area of land with a few bananas and an Animal Token of Expresso on it. They can hop onto Rambi, found in his crate nearby, who helps them defeat the three Gnawties in their path and find the letter N just ahead. Next, Rambi and the Kongs can either enter a Bonus Level to instantly gain the letter G upon exiting it, or hop onto some ledges acting as stairs so they can climb and jump onto the tree holding the letter G. The Kongs and Rambi can fall down from the treetops to break a barrier to find another Bonus Level which they can enter. They can either enter it to continue along if they finish it, or continue down the path, defeating a Klump, hopping over a ledge, and then going to the level's exit on the way, where Rambi stays. The exit then allows the Kongs to move into the next level. If the player climbs the hill above the exit sign and jumps off Rambi, he can get a hidden blue Life Balloon. K: The letter K is on the first ledge where the first Kritter is located. O: The letter O is found next to the Star Barrel found in the level. N: The letter N is near the Rambi Crate next to a group of three Gnawties. G: This letter is automatically obtained when completing the first Bonus Level. It is on the treetops after the last three Kritters in the level. When the primates begin the level, they should climb to the treetops, heading to the fourth tree in the area. If they drop off of the right side of it, they land in a Warp Barrel that takes them in front of the entrance to the second Bonus Level just before a sign indicating that the level is almost over. The game's first photograph is located in Donkey Kong's tree house, found on top of the ledge that Donkey Kong lands in front of at the beginning of the level. 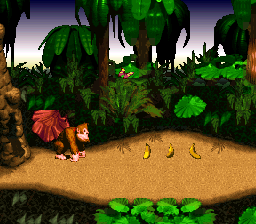 When the ape reaches the house, he can run behind a large bunch of bananas to discover the hidden photograph, giving the Kongs a picture of the game's title screen in their scrapbook. The Kongs run into the photograph as they run through the first Bonus Level. The photograph gives them an image of Donkey Kong sitting on Rambi for the scrapbook. After the letter N is obtained, the heroes must walk to a nearby wall to the right of them and break through it with Rambi. After the wall breaks open, an entryway is revealed, which the group must go in. They then end up in a Bonus Level, where they may collect as many bananas as possible scattered around. At the end of the cave, the Kongs and Rambi must walk into the opening to exit the Bonus Level. When the heroes exit the first Bonus Level, they can break open a wall below the treetops to create an opening that they must enter to get in the second Bonus Level. Here, the heroes must hit a few barrels to stop the pictures of Animal Tokens displayed on them. If they can match the images on all of the barrels, they win the token viewed on the barrels, and then exit the stage. If they lose, they are forced out of the stage with nothing. 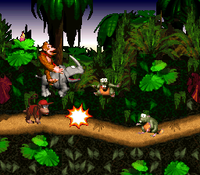 In the pre-release version of Donkey Kong Country, Jungle Hijinxs had a nighttime setting. Jungle Hijinxs was originally known as "Jungle Japes", a name which was eventually used for the first world of Donkey Kong 64. The Game Boy Color and Game Boy Advance versions of this level both take place during mid-day instead of sunset/dusk, and the sky never changes. This was likely done due to technical limitations or so that players could navigate through the level without losing visibility (the Game Boy Color and original GBA had no backlight to make the screen brighter). The music for Jungle Hijinxs and in later jungle levels, "DK Island Swing," went on to become an iconic theme in the Donkey Kong franchise, and has since been arranged many times in later games, including the Super Smash Bros. series. ↑ Batchelor, J. (April 9, 2017). From Donkey Kong to Snake Pass: the music of David Wise. Eurogamer. Retrieved June 28, 2018. This page was last edited on April 12, 2019, at 03:53.